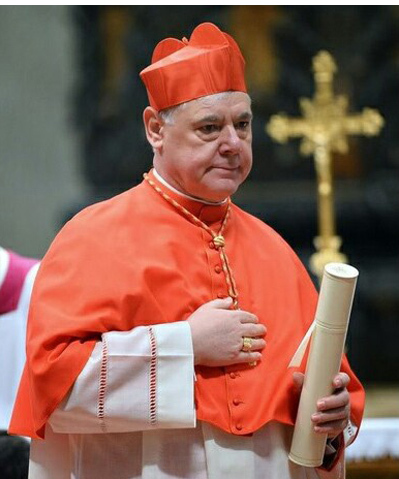 On February 22, 2014, Archbishop Gerhard Ludwig Müller, head of the Congregation for the Doctrine of the Faith, was made a cardinal. 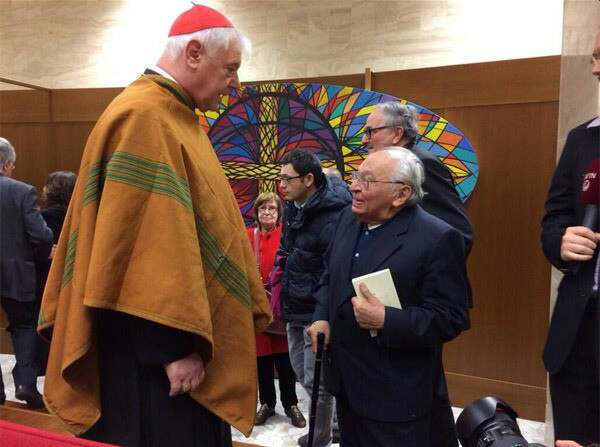 Three days later, on February 25, he received at the Vatican office of his Congregation Peruvian Fr. Gustavo Gutierrez, the so-called father of Liberation Theology. The event was the launching of Müller's book Poor for the Poor - The Mission of the Church in its Italian edition (Povera per i Poveri - La missione della Chiesa). The book's preface is by Pope Francis and it includes contributions by Fr. Gutierrez (two chapters) and Fr. Josef Sayer, a German priest who served as a " slum priest" in Lima, Peru. In his preface Francis defends that "when a man advances to recognize the fundamental solidarity that binds all men ... then he understands that he cannot possess for himself the goods he owns. ... When the goods he owns are used not only for his own needs but are spread out, they multiply and often give an unexpected fruit." After this frontal denial of the right of private property, Pope Bergoglio indirectly but clearly endorses Liberation Theology. He affirms the theology of the book (Liberation Theology) is his way and recommends that readers adopt it. These are the final words of his preface: "I want you to know, dear readers, that in this appeal and in this way you can find me from now on with you, as a brother and a sincere companion along the road." In the launching ceremony, four speakers addressed the audience: presenting the book were Card. Oscar Marradiaga, head of the Pope's Council of Cardinals, and Fr. Federico Lombardi, Vatican spokesman. Fr. Gustavo Gutierrez spoke as a co-author and Card. 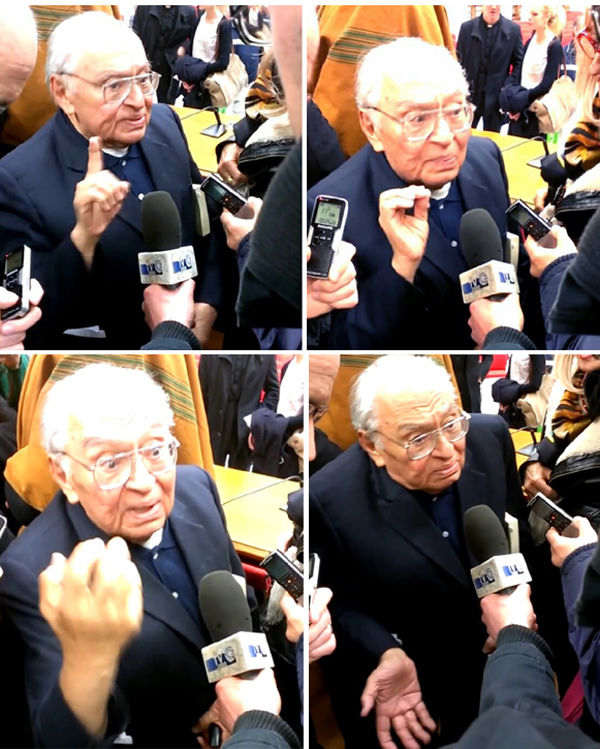 Müller expressed his gratitude for the preface by Pope Bergoglio and the presentations of the speakers. In the declarations both Card. Muller and Fr. Gutierrez made to the press, as soon as the ceremony ended, they strongly defended Liberation Theology. For details read here. For some time now the Vatican has been approving Liberation Theology: see here, here, here & here. 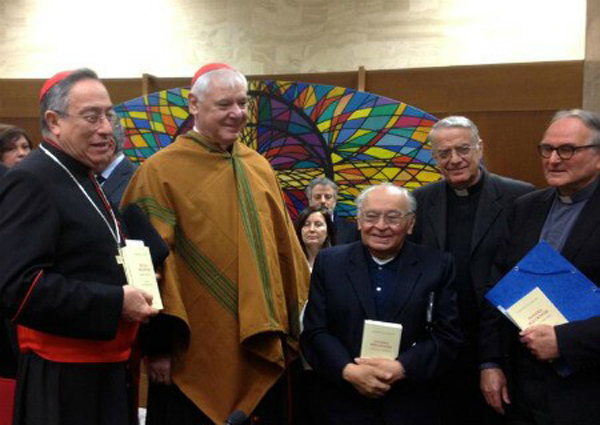 Muller was wearing a Peruvian "poncho" over his cardinal robes to emphasize his solidarity with the poor of Peru. In the photo above, one sees from the left, Card. Marradiaga, Card. Müller, Fr. Gutierrez, Fr. Lombardi and Fr. Sayer. Below first row, Muller chats with Gutierrez; second and third rows, Gutierrez pontificates to reporters; fourth row, Muller at the ceremony where he was made cardinal. Is the Vatican Sponsoring a New Liberation Theology?